We are delighted to announce we have received the highest possible accreditation from the Best Companies survey – 3 Stars! Every year, Best Companies conduct a nationwide employee engagement survey which asks employees questions across eight categories. 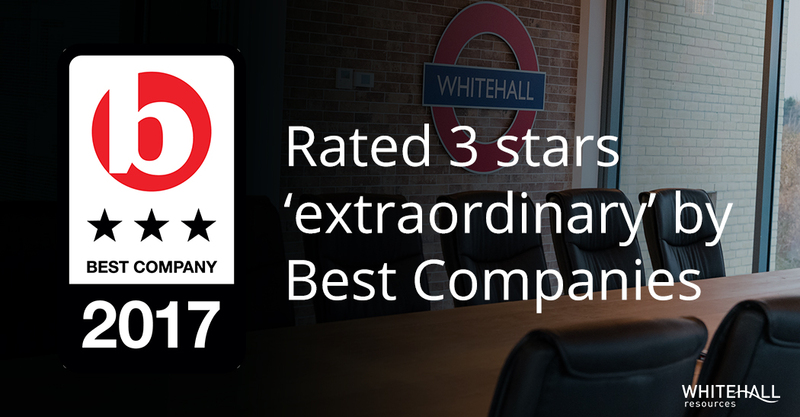 This is the first year we’ve taken part, and the “Extraordinary” rating we were given should give our team, candidates and clients great confidence in Whitehall and our future. This year our turnover grew 22% to over £37.5m turnover and over 85 employees. Whilst we did this, we put great efforts into maintaining our great company culture. We push our teams to reach higher, to go further and it’s our culture that means we attract and retain the best people and continue to give outstanding service. Next year looks to be bigger and better than ever – we will be moving into our brand new £4m office building and will be growing each of our teams to make us even more responsive, covering even more of the market, and maintaining our position as industry experts.